Last week we flew to Los Angeles to start a project to develop tsunami guidelines for bridges. The meeting was at the University of Southern California (USC), which is in a pretty area surrounded by urban blight. 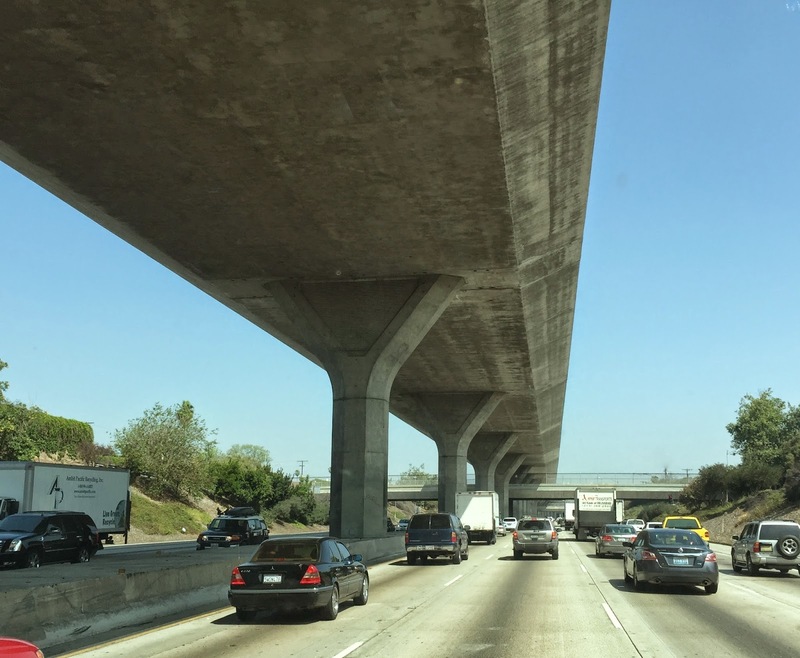 I took the shuttle from LAX onto the Harbor Freeway where we drove under one of my first bridge projects, a very long, elevated HOV structure. I was responsible for the advanced planning study and so I drew a two lane box girder superstructure supported by Y-shaped columns. When the project finally went to design, the open Y's must have made the designers nervous, so they filled them in. My experience as a bridge engineer is that you do the best you can on the parts of a project that you're given and accept that it is a very collaborative effort. Los Angeles County, California Bridges: 51st Street Overcrossing on the Harbor (110) Freeway by Mark Yashinsky is licensed under a Creative Commons Attribution-NonCommercial-NoDerivatives 4.0 International License.